If he succeeds, they'll get there before NASA and Elon Musk. It’s the 21st century, yet these days it’s feeling an awful lot like the frosty bite of the Cold War is, somehow, back from the dead. We’ve got Russian attacks on American institutions (well, cyberattacks, but still) and meddling in our elections, we’ve got former Russian spies getting killed on what is likely Putin’s orders on British soil. And now, Putin has announced that he plans to send manned and unmanned missions to Mars as early as 2019. He also plans to send missions to the Moon and deeper into space. If the manned Mars mission is successful, Putin’s faction will get there years before competing missions from SpaceX (which anticipates sending humans to the Red Planet in 2024) and NASA (in the 2030s). NASA also plans to send another unmanned mission to Mars in 2020 specifically to find signs of past microbial life. Elon Musk, the CEO of SpaceX, recently said that he plans to start testing the BFR, the ship that might take humans to Mars, a bit earlier than anticipated, completing the first test flights by early 2019. Putin didn’t give any additional information about when the launches might happen. If its recent track record is any indication, however, Russia might not prove to be such a strong competitor in the race to set foot on the Red Planet. In 2011, the Russian probe Phobos-Grunt was headed for Mars, but instead got trapped in the Earth’s orbit and eventually fell into the Pacific. And that’s just the most recent in several decades’ worth of interstellar failures. Putin also didn’t elaborate on why he wanted to send Russians to Mars. But what drives anyone to pursue space exploration? To bring glory to their homeland, to further scientific understanding — and, yes, to assert international dominance. 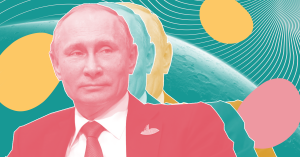 If the nation’s space program has worked out its kinks, and can launch successful spacecraft in the timeline Putin says, Russia might have a decent shot at accomplishing all of those things.